The Amish Yellow Pine Marlboro Bench will sit pretty in pine wood on your front porch or in your patio, garden or pool area. Have a seat with your favorite drink and a great book on this cozy bench that's custom made for your outdoor furniture collection. The Marlboro makes a lovely centerpiece for your outdoor scene, with a beautifully shaped bench back and wide arm rests to support you as you sit. Amish made in Pennsylvania, this outdoor wood furniture is built to last. 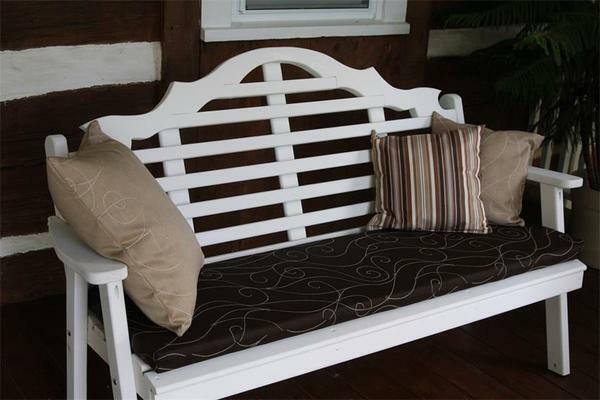 Custom options for your outdoor seating provide you with the look you are going for.